December quarter growth was a stronger than expected 0.6% quarter on quarter as strength in consumer spending, public spending, dwelling investment and inventories more than offset weakness in business investment and a zero contribution from trade volumes. 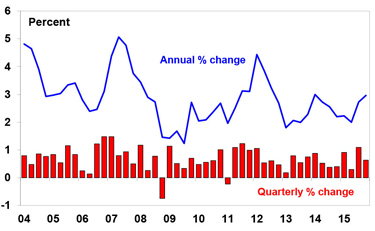 This combined with an upwards revision to September quarter growth pushed growth for the year to December up to 3%. Looking ahead the drag on growth from the unwind of mining investment is set to continue, with the latest business investment (capex) plans from the ABS point to mining investment falling at the rate of 35% or so over this financial year and next and continued softness in investment overall. This is knocking around 1 percentage point off annual economic growth. 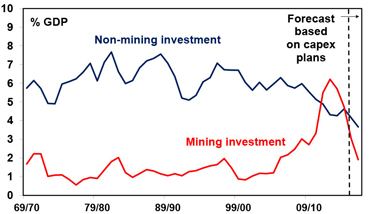 While slumping mining investment is no surprise what is concerning is that the outlook for non-mining investment remains weak. 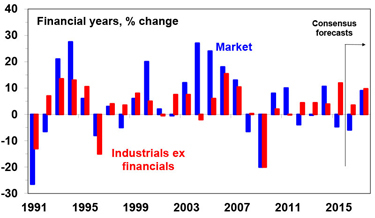 Taken together the investment outlook remains poor – although not quite as weak as the next chart suggests as the ABS capex plans exclude several key stronger sectors of the economy (like health) and tend to exaggerate weakness. More broadly, several other factors are likely to weigh on growth going forward, including: steep falls in commodity prices that continue to cut into national income growth; household reluctance to take on more debt; and subdued levels of confidence. And peaking building approvals point to a slowing contribution to growth from housing construction in 2016-17, at the same time that mining investment will be continuing to fall. As a result of these considerations economic growth is likely to slip back to around 2.5% over the year ahead. However, apart from the reality of growth holding up despite the mining boom ending several years ago, there are several other reasons not to be gloomy on Australia. First, consumer spending is growing at 2.9% supported by borrowing rates at generational lows (don’t forget that Australian’s owe the banks about $1.3 trillion more than the banks owe them – so the household sector remains a net beneficiary of low interest rates), the fall in petrol prices is saving the average household about $15 a week compared to two years ago and the support from a relatively high household savings rate. Second, the fall in the $A is a big positive for manufacturing, tourism, higher education, services, farming and mining. 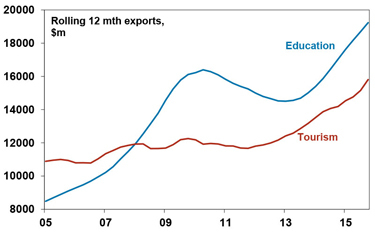 Export earnings from tourism and higher education are running at record levels after earlier getting flattened by the surge in the $A to above parity. 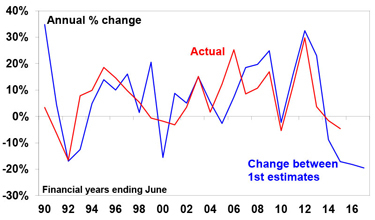 Third, Australia managed the boom better than it has in the past when booms led to inflation or trade deficit blow-outs or both and all sectors of the economy boomed together and went bust together. This time there was no major build-up of imbalances in the economy and sectors suppressed by the mining boom have bounced back. Consistent with this, while growth in the resource rich states of WA and NT has crashed, it’s strong in the population rich states of NSW and Victoria. Annual growth in state final demand is running at 3.3% in NSW and 4.6% in Victoria compared to -4.7% in WA and -17.7% in NT. Finally, by mid next year mining investment as a share of GDP will have fallen to around 2% from its boom time peak of near 7%, meaning that the mining investment boom and its drag on growth will largely be behind us. This should all mean that the risk of a recession remains relatively low. However, with growth likely to slip back to around 2.5% this year (which is less than anticipated by the RBA) and inflation likely to remain low we remain of the view that the Australian economy will require further help. As such, we continue to expect that the RBA will cut the cash rate again in the months ahead. However, with growth exceeding expectations last year and the job market holding up well it’s now a close call. 62% have raised their dividends (which is in line with the norm). While the big miners are cutting their dividends this is hardly a surprise and in any case BHP is now just 4% of the market and RIO just 1.5%. While resources profits are likely to fall 65% this financial year, most of the big banks are seeing reasonable results and stocks exposed to the Australian economy, led by housing and the consumer, are doing well. The better than feared nature of the results has been reflected in 65% of stocks seeing their share price outperform the market the day results were released. 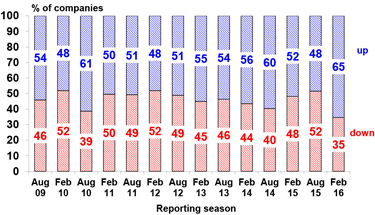 Overall profits are likely to fall around 5% this financial year, but outside of resources, profits are rising modestly. The continuing low Australian dollar and low interest rates will help. With Australian economic growth likely to slow back to around 2.5% interest rates are set to remain very low and likely to fall further. So bank deposits are likely to continue to provide low income flows. However, there remains no need to get too gloomy on the outlook for Australian assets. The economy is likely to avoid recession as growth continues to gradually rebalance. While the Australian share market ran ahead of itself early last year, pushing up to just below 6000, the slump we saw early this year saw it overshoot on the downside. We continue to see the Australian share market being significantly higher by year end.